Brayden Sier will make his long-awaited AFL debut in Saturday night's clash with Gold Coast at Metricon Stadium. 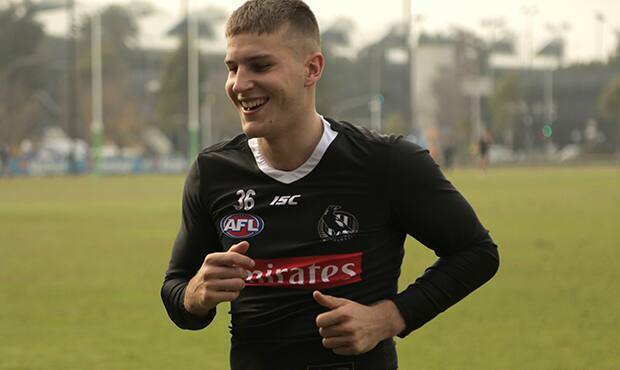 The 20-year-old big-bodied midfielder found out he was playing prior to the Magpies' training session at the Holden Centre on Thursday morning. "Good way to start training on a cold morning like today," Sier, who wears the No. 36 guernsey made famous by Dane Swan, told Collingwood Media after the session. "It's something I've been waiting for for a long time, so I guess there's a bit of relief. "Now I get to officially call myself an AFL player." Selected by Collingwood with pick 32 in the 2015 national draft, Sier endured a horror run with injuries during his first two seasons at the club. But a combination of better luck and improved fitness and attitude has turned his career around. "By his own admission, (he) probably didn't have football high enough in his priorities in the first 18 months (of his time at the club)," Pies coach Nathan Buckley told AFL.com.au in February. "The last half of last year Brayden really knuckled down and saved his career at Collingwood in many ways, and showed the club that he was serious about being an AFL footballer. So he earned another year on his contract." Sier now gets his chance at the highest level as a replacement for star midfielder Adam Treloar, who suffered injuries to both his hamstrings in last weekend's win over Carlton. "I'm sure I'll be a bit nervous," Sier said. "I usually try and stay pretty calm, so I'll just do what I normally do. "I'll trust that I'm there for a reason and I'll just go out and play footy. I won't over complicate it. "I'll go out and play with the boys and hopefully get a win." Sier is Collingwood's fifth debutant this season, following in the footsteps of Sam Murray, Jaidyn Stephenson, Flynn Appleby and Brody Mihocek.